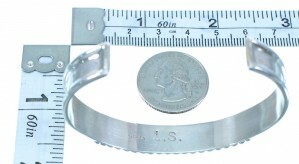 The inner bracelet circumference measures approximately 5-3/8", plus a 1-1/4" opening, and 3/8" at widest point. Looking at such beauty tells the capabilities of Native American art! 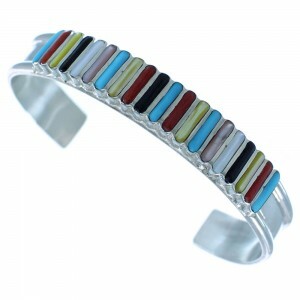 This piece of Native American jewelry is Zuni hand made by artist Lucy Shekya, out of genuine sterling silver and real Multicolor inlay. 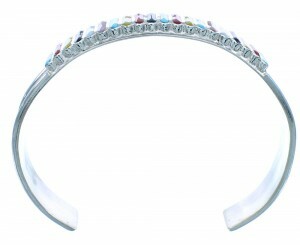 The inlay consists of: Turquoise, Coral, Jet Pink Shell, White and Yellow Mother of Pearl. The inlay is delicately set, while thin silver lines can be seen accenting in between and completing the bracelet perfectly. 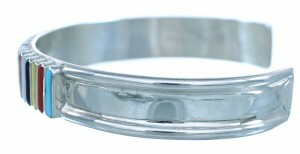 The bracelet is stamped sterling, signed Zuni, and hallmarked.